75481DRB is rated 3.0 out of 5 by 46. 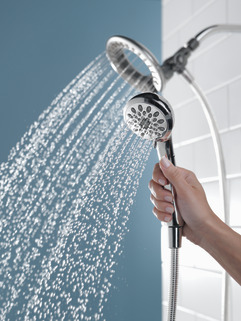 Rated 1 out of 5 by Gloria from Very Disappointed After I purchased this showerhead, the connection to the water supply cracked on installation. And because it is made of plastic and is so hard to release the smaller shower head from the base, I'm afraid every time I try to release it that more pressure will cause more damage. I will be returning it as soon as I can. Rated 2 out of 5 by Beth from nice features I bought this 3 days ago. I was disappointed. The packaging does not provide a good description. It’s all plastic. I picked up the wrong one, but it was installed before I can take a good look at it. Now I am stuck with it. 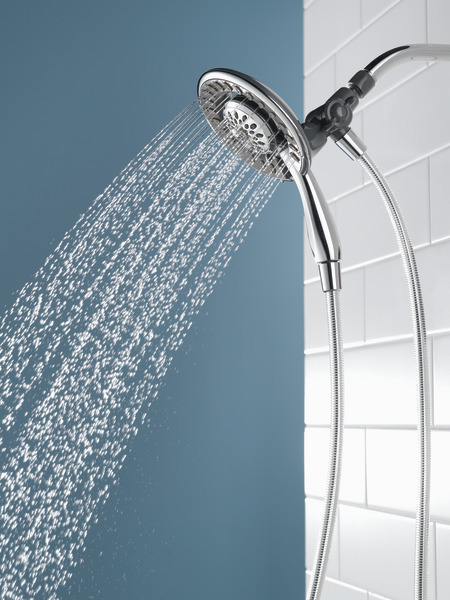 I use to have the model # 58480 with H2Okinetic technology in my previous home. Much better product. I would not pay more than the asking price for the 75481D model. I see why its discontinued. I wish I could return it. To make matters worse I purchased 2. Rated 2 out of 5 by Nazbrat from Worked great for 3 years. 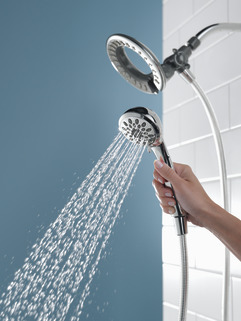 I purchased this in 2015. recently my Handle has developed Cracks that run up the length of the handle itself and Water is spraying out from there. It has Not been abused but yet its cracking apart with the Finish peeling off with sharp edges. 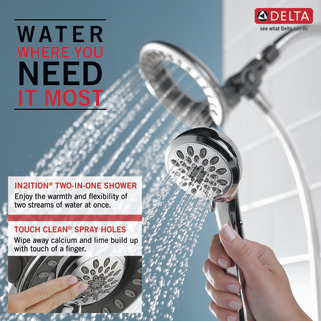 Rated 5 out of 5 by T gillespie from reasonably priced this is a reasonably priced shower head that feels like a rainforest downpour when you are under it. It has a lifetime guarantee and it was the easiest thing I ever did installing it. Rated 2 out of 5 by Jnette from I like the idea of this shower head but it truly was a waste of my money. It’s t It’s much too short for one. Second the water pressure is AWFUL! 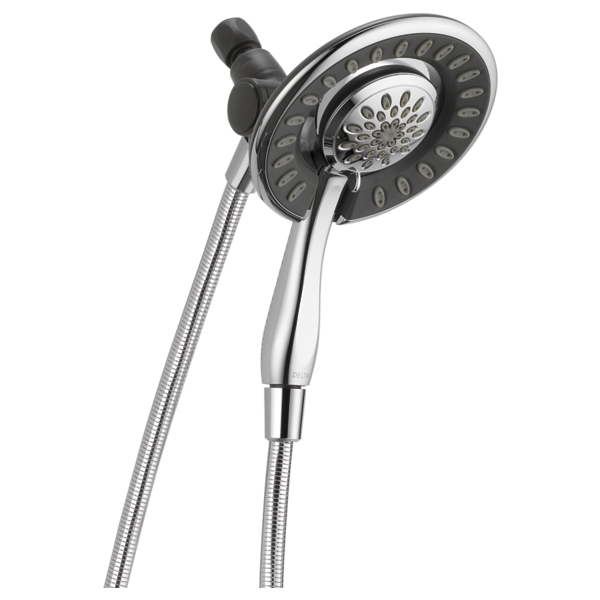 Truly one of the worst shower headed I’ve bought in a long time. Rated 1 out of 5 by LOG29 from Head does not tilt I got it installed yesterday and to my surprise the head does not tilt, so it shuts the water directly into my glass wall and i have to be very close to the wall to get rinsed .... i am really not looking to take a shower anymore :( I am removing it this weekend and returning it. I purchased a 2 in one shower 5 spray pattern In2ition and it is now leaking. I have identified that the gasket that goes around the rotating ball is torn. I would like to order a replacement gasket. Can you please let me know what the part number is? 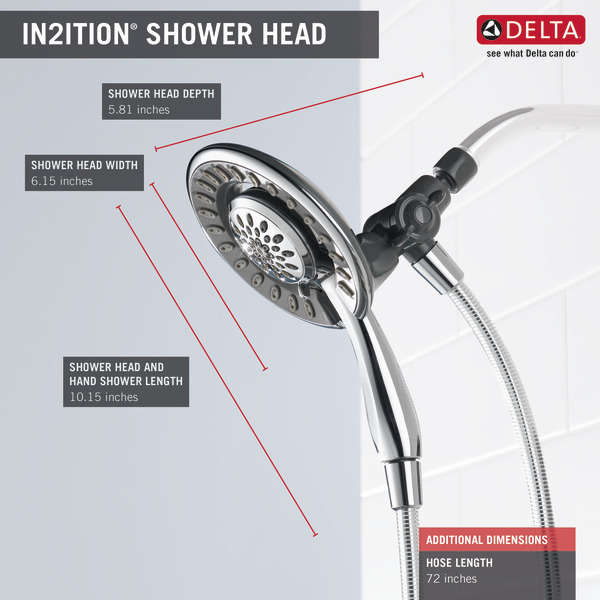 Bought the In2ition shower head at Lowes about a year ago, There is very low water pressure/flow coming out of it? Not acceptable. Is there a restrictor that can be removed? I bought a 75481D in brushed nickel and the fllexable hose looks to be chrome is this a mistake? I bought a similar one a few years ago in brushed nickel and the flexible hose is covered in plastic, giving it a brushed nickel look. Which way is correct? The water pressure from the Model 75481D that I installed yesterday is unacceptable.How do I remove the flow restictor? 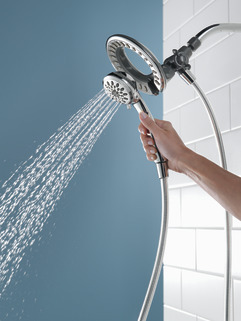 I purchased this as my husband sits on a shower chair and the hose needs to reach to the opposite side of the shower head. It's just short and Amazon has longer generic hoses that I can purchased. However, I don't see where you have listed the diameter of the hose on this unit so I can determine if the longer one I found will work. I love the shower head and the two showers in one but the hose is just not quite long enough. Thank you. What is the difference between the 75481, 75481D, and 58045? Hi Rob, The difference between models 75481 and 75481D is the rated GPM. The &quot;D&quot; version of the faucet is intended to comply with water conservation initiatives instituted in several areas of the country. 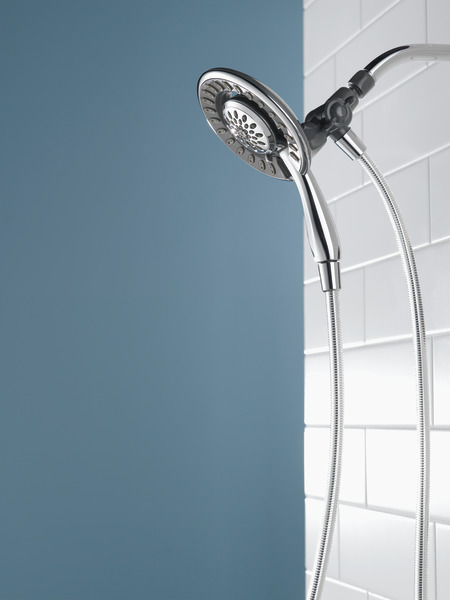 The 58045 is a trade version of the same handshower, indicating that it would be fully plated as opposed to having some gray plastic areas.